My mom-in-law is cooking Thanksgiving dinner this year, but she put Kent in charge of this bad boy! We forgot to make this last year and the guys really missed it, so my hubby whipped this up for the table. Yummy. Saute the onions and mushrooms with the butter in a saute pan. Boil green beans in chicken broth and water for about 10 minutes and drain. 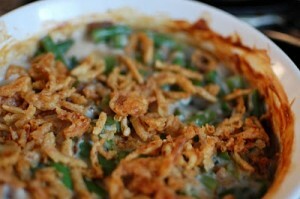 Add the green beans, the cream of chicken soup, crispy onions, to the onion mixture. Transfer to a buttered 1½-quart baking dish. Bake for 15 minutes, then top the casserole with the cheese and bake for 10 to 15 minutes longer, or until the casserole is hot and cheese is melted.